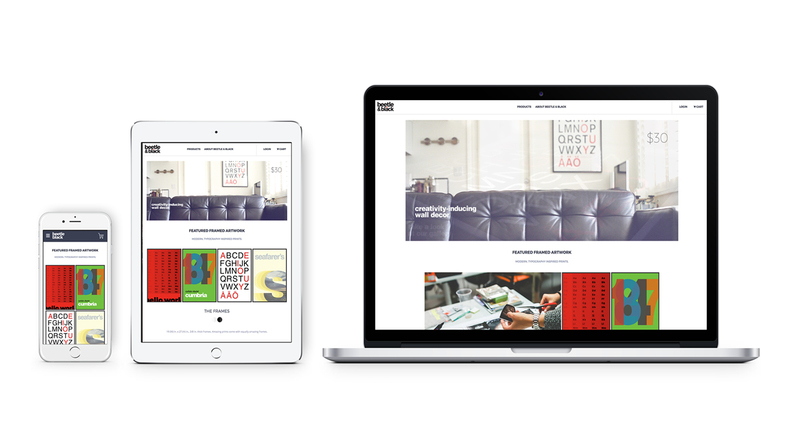 Beetle & Black, a custom artwork printer and designer, asked us to develop a complete brand experience and create the company’s 6 and 12 month online strategy plan. We are proud of how this project rolled out this year. The Beetle & Black brand is centered around the type of artwork that the studio designs, and often includes strong emphasis on typography, Swiss design, and beautiful white space. The message to convey had to be in tone with the studio’s high levels of imagination and creative power, and the online experience had to match this characteristic. Overall, the online presence must quickly convey not only the right message, but portray the right type of feel that customers should be aware of almost instantly. The potential client base that the studio relies on will interact with Beetle & Black exclusively via the online portal. This made our task significantly more important given that the only way customers connect to the studio and its products is via the storefront. We had no way of creating a physical presence to convey the characteristics of the brand and virtual mediums are notoriously difficult. Nevertheless, we worked diligently on understanding the studios approach to design, materials and overall craftsmanship. This gave us the best understanding of what makes the studio special and how the artwork and materials used in production create valuable artwork. By studying the physical products and the design process employed at Beetle & Black, we could translate these into a complete virtual experience using similar clean lines, typographic elements and patterns that transcend the virtual realm into almost physical experiences. We employ user experience design into every project we work on. For Beetle & Black, we designed an online experience that is altered to match the device the user is holding. For small devices, we simplified the element layout, created grid block elements that allow for easy navigation and quick understanding of the content. As the user devices get larger in size, the design is expertly crafted to include additional patterns and increase white space in order to segment content by importance and type. The end result is not a “mobile vs. desktop” experience, but rather a powerful user experience that is tailored specifically for the device being used. The project is still being developed, and we are working steadily towards continuing to build the brand’s presence and grow Beetle & Black’s influence in its market. We are proud of how this project was designed and executed.